If you own or manage a retail, professional, industrial, non-profit or governmental organization and you’re looking for effective, cost-efficient snow removal, it’s important to differentiate between residential and commercial snow removal – they are very different tasks requiring specific expertise and equipment. 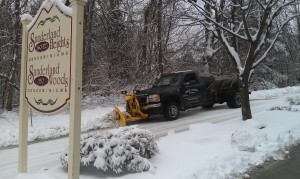 Here at Mike Lynch Enterprises, we specialize in commercial snow removal. We understand how important it is for businesses, agencies, and organizations to be open and operational on a timely basis. Time is money and you’re losing money for every hour your employees and customers can’t reach your place of business. That’s why we monitor regional weather very closely all winter long – snow, freezing rain, and ‘nor-easters can all wreak havoc on businesses not prepared to handle adverse conditions. We’re prepared to roll equipment 24/7 and provide full commercial snow removal operations within minutes of receiving information. We even have a full-time mechanic on staff in our local, fully-equipped service garage so we can keep our equipment on the road for prompt, professional, around-the-clock commercial snow removal and sanding services, with minimal down-time. Our complete commercial snow removal services include snow plowing for driveways, parking lots, and storage/loading areas; as well as salting and sanding. Our experienced equipment operators and plow drivers are available around the clock to keep your business or organization snow-free and operational. Our front-end loaders and backhoes enable us to handle even the most extreme snow conditions and assist in removing and relocating snow from commercial or industrial sites. We provide commercial snow removal services for a wide range of businesses and organizations, including corporate office buildings, industrial properties, schools, medical facilities, rental properties, religious institutions, retail businesses, shopping complexes, and more. How good are we? We offer services for downtown commercial lots to keep plenty of parking open and available for events at the DCU Center. Give us a call or drop us an email today to discuss how we can help take the worry out of winter with prompt, professional commercial snow removal.